Last Sunday, Mom and I got to talking about why essential oil chemistry is something worth learning about. Even when Sylla began studying aromatherapy over 40 years ago, she felt resistant to learn this molecular science. However, once she did, the world of essential oils opened up to her in incredible ways. Though decades behind, I can attest to the same. We both agree there is great value in understanding the chemistry of essential oils. You’ll sound like a NERD … Yeah, we actually think it’s cool to be nerdy when it comes to chemistry. Knowing the chemistry makes you sound smart (who doesn’t want that?). You can pronounce words like cinnamaldehyde and alpha-bisabolol. More than that, you know what they mean and how they contribute to the therapeutic effect or safety concerns of the oil. Plus, being smart also means that research papers and conference presentations make a lot more sense. It is not as hard as you think. Unlike the organic chemistry class you had in college, essential oil chemistry is primarily concerned with only three elements: carbon, hydrogen, and oxygen. Just knowing that all the aromas we work with are virtually countless combinations of these three elements still blows our mind! When you think on the molecular level, you enter a whole new world. This can open doors to other fields of study, perhaps biochemistry or physiology. Then, you start to understand how your own body works, which gives you a deeper understanding of health and healing. Learning about essential oil chemistry means you’ll be more informed on how to read and understand the components of a new oil or product. You can look up the constituents (Need a resource? Our Aromatherapy Practitioner Reference Manual has a Phytochemical Index) and what the known therapeutic properties of that component are. You’ll also learn how to not fall into the trap of determining effects based solely on major components. A study of essential oil chemistry quickly reveals the nuances of these “potent chemical cocktails,” as Dr. Tim likes to call them. You’ll learn that the magic of the oils comes from the chemistry. For us, this doesn’t break the spell. It’s just the opposite: understanding the science only enhances the magic. So, you want to be a nerd? In October, we are hosting Dr. Timothy Miller for AromaChemistry, a fun-filled weekend of nerdalicious learning. Even though we both teach essential oil chemistry in our Beginner’s Course and Practitioner Training, we wanted to host Tim because he’s like no other teacher we’ve ever had. You can see how Tim and I get along so well. “I’ve studied a bit in my 40 years, and Tim Miller stands out as an exceptional teacher. Not only does he have a tremendous amount of knowledge and experience in his field as healer, but his personality shines through when he’s teaching. He brings a fresh new energy that is quite appealing. … is becoming empowered to make the best blend! There’s a trend in aromatherapy education to simplify things and say that “X” oil works for depression, “X” works for ADD, and “X” works for grief. We, on the other hand, believe in elevating the conversation. There are general claims that can be made about specific oils. For example, for most people, Lavender is a great sedative and Rosemary can act as a stimulant. However, if someone has trouble sleeping or focusing, the trick is to take into account all the factors that contribute to this issue. Then create a unique blend that’s paired with the desired mental state. For this reason, we always hesitate to isolate single essential oils for particular conditions and continuously refer back to this wider perspective. Now, we do find charts to be handy. They can really help us get started on making the best blend. You can find detailed charts to reference in both our Reference Manual and Aromatic Mind Book. What we’ve found in our practices is that clients respond best to a unique blend, rather than a single oil treatment. Blending requires a little more education and experience, while it also welcomes the wisdom of intuition. Our goal as educators is to help foster these qualities in our students. Start using essential oils in your practice. 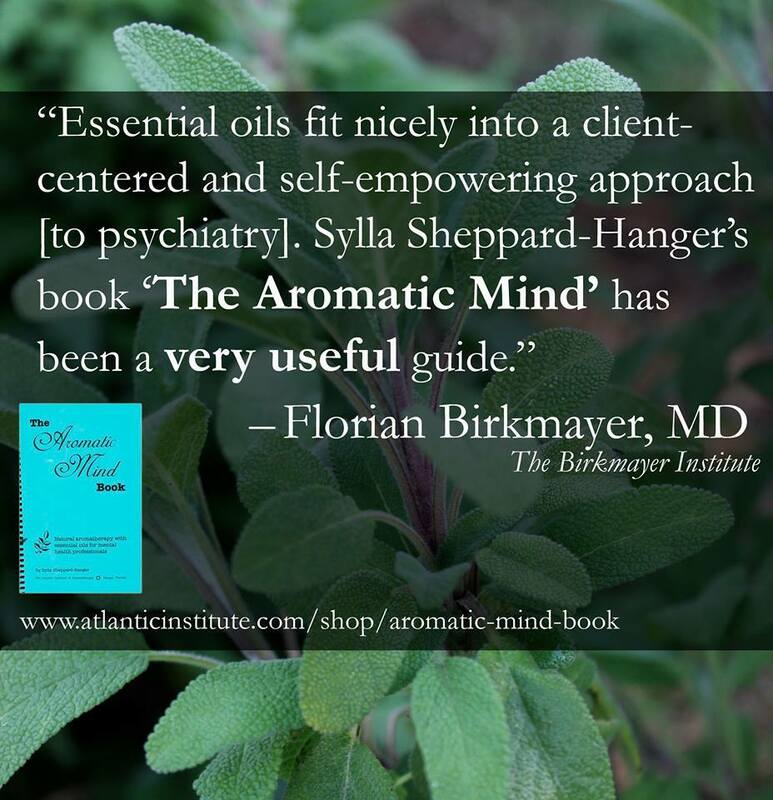 Purchase The Aromatic Mind in our online store today. The Atlantic Institute of Aromatherapy is thrilled to be pairing with Master Herbalist Peter Holmes (L.Ac, M.H.) for the Energetic Uses of Essential Oils workshop this Sept. 27-28! The workshop will be at the fabulous Lido Beach Resort (700 Ben Franklin Dr. Sarasota, FL 34236). Peter is a British-trained Medical Herbalist and practitioner of Oriental Medicine with over 30 years’ experience using botanical remedies and essential oils in clinical practice. His accessible, experiential lecturing style will allow you to grasp a deeper understanding of this branch of aromatherapy, which will in turn boost your practice! But why should you incorporate the energetics of essential oils into your treatments? Essential oils and aromatherapy are very complex. They require a lot of study to understand the components and select the oils that will give your clients the best results. But if you understand the concepts of energy medicine and apply those to your selection of essential oils, you have a better chance of finding the right oil or oils to use for complex conditions. In this context, essential oils are actually similar to acupoints and reflex zones, in that the oils are electromagnetic and governed by the universal laws of energy flow. You can use essential oil energetics both through inhalation and by applying directly onto body zones and points. Once put into effect, the oils will modulate neuroendocrine functions through neuropeptide activation, without putting any strain on the digestive system. The result? Profound energetic changes in the individual, which you can directly measure by changes in pulse, breathing, and the client’s overall complexion. The seminar will include a fresh, dynamic approach to using essential oils for treatment based on integrated energetic principles—and the reasons why this approach works. Peter will also provide practical information about the energetics of essential oils, so you can start using the techniques right away. Energetics of essential oils are highly complementary to conventional aromatherapy, bodywork, energetic healing, and so much more. By incorporating energetics into your practice, you’ll boost your chances of seeing true and lasting change in your clients. So don’t wait! Register here. CEU’s are available for Florida LMT’s and A.P., D.O.M. : 12 CEU’s—CE Broker tracking #20-439918. The basic tuition for the workshop is $325, with a Special Buddy Rate of $275 each for pair (total: $550). You can find information to register for group-rate accommodations by visiting this link. Class begins at 9:00 a.m., and attendants are asked to arrive early for check-in. Come prepared for a full day. There will be an hour break for lunch, and you can opt into a prepared lunch on the registration page. Class will end at 5 pm. Class will begin at 9:00 p.m. and will finalize at 5:00 p.m. A lunch break will again be included. Join us for another session of our Introduction to Aromatherapy + Tropical Treatments class on June 28. Discover how to turn a few simple ingredients into a tropical staycation. You might even feel like you had a day at the beach! Learn to create your own tropical staycation with aromatherapy. Most aromatherapy programs provide the option of becoming a “Certified Aromatherapist.” But what does this title really mean? Aromatherapy is not officially regulated, as other trades like massage and nursing are. As a result, there’s a broad spectrum of aromatherapy programs and approaches to marketing out there. We’ve decided against offering the “Certified Aromatherapist” title. Instead, we focus on what it really takes to create confident and empowered Aromatherapy Practitioners. The Registered Aromatherapist or RA designation is the only recognized title in aromatherapy. In order to receive this designation, one must take the ARC’s independent exam. We design our classes and courses to help you become an aromatherapy practitioner. This looks different for everyone. Some people engage in home use for the family; some incorporate aromatherapy into their practices (such as massage); others start businesses doing consultations or selling essential oils. Our APT Program includes hands-on, live classes taught by practicing aromatherapists. One of our aromatherapists has 40 years of client-based experience alone. In addition, you will receive a personalized mentorship to help guide you on your aromatic journey. You’ll also receive access to an online support platform. For us, the ultimate goal is to take the ARC exam and become a Registered Aromatherapist. This is the gold standard of aromatherapy designations. Our classes, courses, and training programs are geared to prepare you for this exam. Do your research before embarking on a route of study. Find the program that’s right for you. Let us know how the Atlantic Institute can help support your practice.